Joining that merry band of doom mongers (HM Treasury, the Bank of England and Chancellor Hammond) the IMF’s Christine Lagarde has again warned of “substantial costs” of a no deal Brexit. In fact of course there is no such thing as “no deal” – we simply go to the World Trade organisation deal, like most of the world’s nations – saving on the way big duties on imports from the rest of the world on cars, food and clothing and saving 40 billion Euros in contributions to the EU budget! The “substantial costs” are in having a deal! 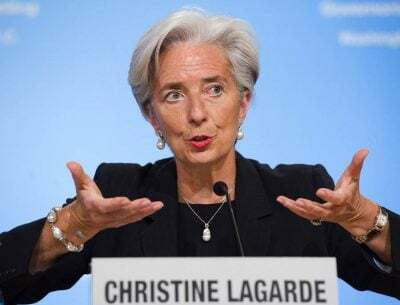 George Osborne-sponsored IMF Head Lagarde (who was found guilty by a French Court of negligence for failing to challenge a Euro 400m payout to a friend of French President Nicolas Sarkozy) has continued that organisation’s negligence and incompetence. When the IMF made a fool of itself in 2013-14 the UK was still showing far healthier growth than the stagnant EU. Today Lagarde says we are in trouble – after 20 years (since the Euro was launched) of greatly outperforming the EU. That is why we have nearly 3 million EU “citizens” working in the UK.